Don't worry, I don't plan on throwing a ton of pumpkin this and pumpkin that at you today, today I am going to show you a quick and easy adult beverage to take the chill out of your bones on a chilly fall evening. Combine your wine, caramel vodka, and apple cider in a large pitcher. Toss in your chopped apples. Serve the sangria over ice and garnish with a cinnamon stick. What are some of your favorite beverages for fall? a blogger friend of mine makes this and i love it heated! i need to make it cold since i love caramel apples just about any time of year! ohh heated would be yummy too! 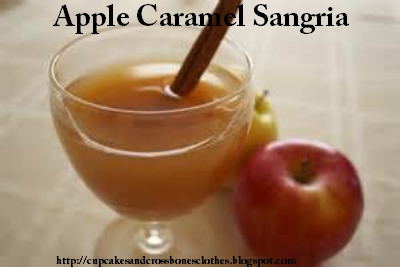 Ohh yum I love Sangria and caramel apples so this is a total win! Yes yes and YES - LOVE IT! oh definitely making this for my friends, they'd love it! It's a hit for sure. Let me know what they think! Thank you for noticing! all of our social media links can be found if you click on our contact tab at the top of our page. We will get to fixing those pesky icons asap. Thanks again!